Every fall, I look forward to my first bowl of butternut squash soup. It is a soup I typically make without the structure of a recipe, and I seem to mix up the ingredients every time. That said, I thought it might be helpful to write this recipe as a framework that offers different options depending on whether you like your soup savory or sweet, thick or thin, or whether you prefer to keep it simple or spice it up. 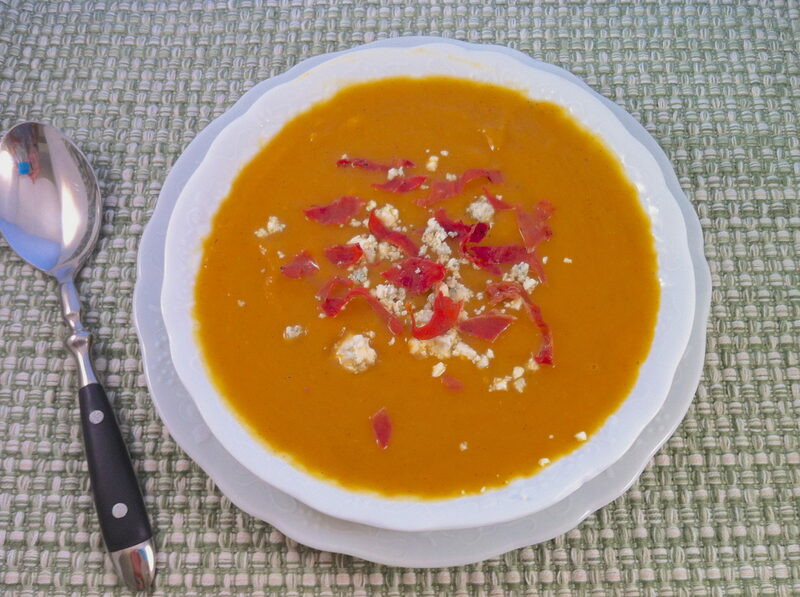 This recipe is the basic version of butternut squash soup I have been making for years. In the notes section, I have included the various ways I like to vary the recipe, depending on my mood and what I have on hand. Whether you make the simple, bare-bones version or dress it up, this soup is a winner! Choose the amount of additional liquid added at the end based on how thick or thin you like your soup. Add onion and curry powder and sauté, stirring occasionally, until the onion softens, 4-5 minutes. Add the butternut squash, apple, 4 cups chicken stock, salt and pepper. Bring to a boil, then reduce heat to low, cover, and simmer for 30-40 minutes or until the squash and apple are very tender. Puree in batches in a blender or with an immersion blender, adding more stock to thin to desired consistency. To play up the savory notes, sauté one carrot and one celery stalk, chopped, along with the onion. Omit the apple and top with with crumbled blue cheese and crisp bacon or prosciutto. For a creamy finish, add 1/2 – 1 cup cream instead of additional broth in the final thinning stage. To play up the sweet flavors, use apple cider for the final cup of liquid. If you are a garlic fan, sauté 3-4 cloves (or more to taste) of minced garlic along with the onions for 30 seconds before adding the squash and remaining ingredients. One tablespoon of minced, fresh ginger can be added along with, or instead of, the garlic. To further enhance the ginger-curry combination, consider using coconut milk as your final liquid addition. For a tangy kick, top the finished soup with a spoonful of plain yogurt, sour cream or creme fraiche. Sprinkle toasted pumpkin seeds over individual servings. A friend of mine likes to stir in a large dollop of peanut butter for a nutty flavor. This is one add-in I haven’t tried, but it is next on my list! Do you have tips on the best way to wrangle this fabulous vegetable? They are hard to cut, Mary Lou! I have been most successful with using a vegetable peeler and then using a large knife to cut into big chunks. How about this…you could pierce the skin with a knife a few times and microwave it until it is just a bit soft. That way, you won’t have to wrestle so much with it and risk cutting yourself. Let me know how you make out. P.S. My friend who adds the peanut butter called me the day I posted this and said she was making her peanut butter version that day. I still have to try that! A Y-peeler makes quick work of peeling…it’s a miracle. I just replaced my old one and it is amazing the difference in the sharpness and how easy it is to peel these hard squash. Try it. Great suggestion, Terri! It is funny you said that because I just replaced an old box grater that I actually use frequently. I had no idea how dull my old one was until I tried the new one! Let me know how that turns out! I need to get to our Farmer’s Market tomorrow to get more squash. I am going to make this one weekend. We like butternut squash soup, but I’ve never tried with apples in it! I hope you enjoy this version, Winnie! Let me know what you think! You have come a long way! Welcome to PA…that is where I live, too! Thank you for your wonderful comments and I hope you enjoy some of the variations. I like you idea of adding some cayenne! This is one of your many recipes that I always come back to – we just think it’s THE best! Just made a vat of it for a soup Sunday at my church and it was a hit. The options I always use are coconut milk and grated fresh ginger. I also usually add chicken and kale. One other flavor addition that I came up with is to add a little freshly grated nutmeg when I can find actual nutmegs. I’m thrilled this has been a go-to recipe for you, Lisa, and appreciate the thoughtful feedback. Your additions of chicken and kale sound lovely!